Red Comet Unveils Brand New High School Courses in Mathematics. Red Comet, an Accredited, Self-Paced, Online High School, Launches New Enrichment Courses in Mathematics. Red Comet is excited to launch several new courses in mathematics. For the 2014-15 school year, students may enroll in new enrichment courses related to Advanced Algebra with Financial Applications, Pre-Calculus, Calculus, Comprehensive Algebra, and Comprehensive Geometry. This rich curriculum will expose high school students to the various applications of mathematics and prepare them for future college level courses. Students who want to explore potential career prospects in the field of mathematics will find the curriculum rigorous and interesting. 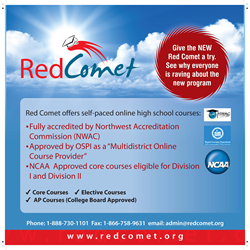 Red Comet is a Fully Accredited (NWAC, AdvancED) organization that has been offering online courses for credit since 1999. Students have over 175 courses to choose from. Many of these courses are also approved by the NCAA organization. In the State of Washington, the Office of Superintendent of Public Instruction (OSPI) has approved the Red Comet program as a “Multi-District Online Provider,” “Online Course Provider,” and “Online School Program”. In a statewide survey, Red Comet received high ratings for student satisfaction. Students use the Red Comet online program for original credit, credit retrieval, and credit recovery.